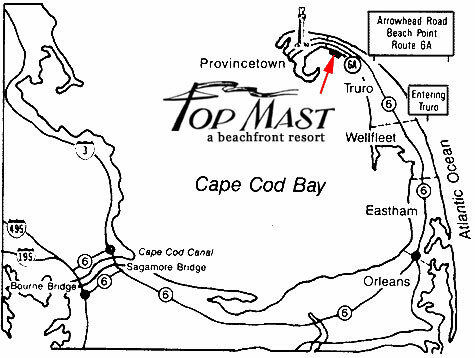 For Navigation: Top Mast Resort is located at 209 Shore Road, North Truro, MA 02652. Stay on Rt. 6E for approximately 35.5 miles until you come to the Orleans Rotary. Go ½ way around staying on Route 6E, follow the sign to Eastham/Provincetown. Approximately 6 miles after the ENTERING TRURO sign turn left at the ARROWHEAD ROAD-BEACH POINT sign. At the end of Arrowhead Road, turn right onto Route 6A/Shore Road and continue down the hill ½ mile to Top Mast Resort! Our office is located on the right hand side of the street, opposite all the beachfront buildings. Once over the bridge follow Route 6E for approximately 35.5 miles until you come to the Orleans Rotary. Go ½ way around staying on Route 6E, follow the sign to Eastham/Provincetown.